You are confident and larger than life, and you feel as lucky as ever. 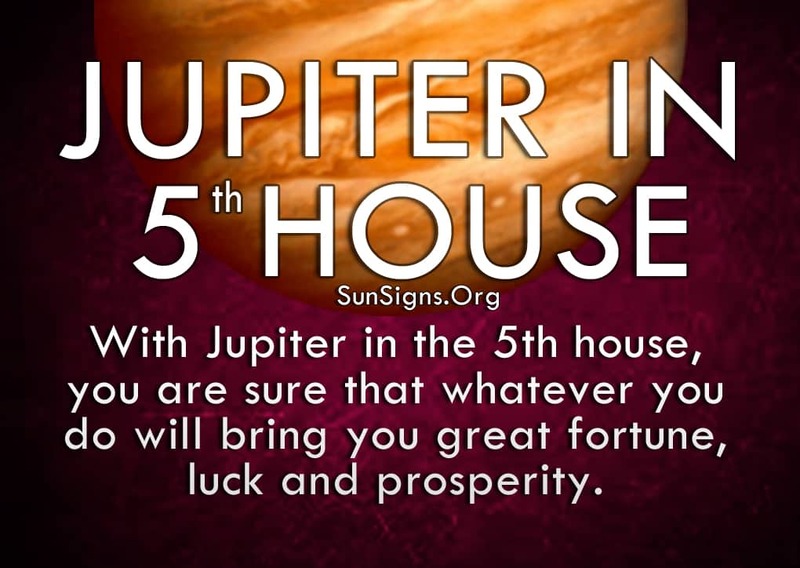 With Jupiter in the 5th house, you are sure that whatever you do brings you great fortune. And because of your generous nature you are willing to share this good fortune with all your loved ones. Jupiter symbolizes good luck, wealth, prosperity, fame, optimism and generosity. Your upbeat attitude keeps you excited and enthusiastic, which helps you enter into any situation with plenty of gusto. You know no fear which allows you to take risks that other people might avoid. And since you love a challenge you are able to overcome almost any kind of adversity. This puts you worlds ahead of other people, who would take their time to create a plan, or not go ahead at all. But the bold attitude of Jupiter in fifth house people almost always serves them well. Your creative endeavors keep you fully engaged in life. You are happiest when you are entertaining friends and family. Your playful nature keeps people coming back for more. You love being in the spotlight and they keep putting you there. Remember to use your good-natured attitude to bring joy into people’s lives, and they will return the favor. People know you are warm and caring, and they flock to your side when they want to feel better about themselves. You know how to show people a good time, and this is what makes you happiest. (Read about Jupiter in signs). And when you are at the top of your game, that’s when you bring in the best luck. So put your ego aside for a while and focus on those around you. Not only will it make them happy, but it will fuel your need to have them pay attention to you. They love spending time with you, as there is never a dull moment. The Jupiter in 5th house astrology suggests that you should remember that there are other people who sometimes want to take the reins and be in control of the situation. You tend to take the lead automatically, and often step on other people’s toes to do it. Make sure you’re not overstaying your welcome. Listen to when others have input on something. They might be trying to tell you that you are interfering in a way that is not helpful to the group or the project. Your ego can often get in the way of your better judgment. So you have to rely on those closest to you to let you know when you’re overstepping your bounds. These kinds of misunderstandings can change your luck very easily. (Read more about the ruling zodiac sign Leo). But while you usually end up on top, there are times when unintended consequences get the better of you. Sometimes diving in head first only gets you hurt, or hurts other people. The Jupiter in 5th house people need to learn when it’s right to take the risk and when you should just walk away. (Read more about planet in houses). You thrive on enjoying life and all it has to offer, and your excitement is infectious. You make people feel good about themselves and have a knack for bringing up their spirits. (Find out more about Jupiter symbolism). When you share the spotlight, you also share in the good feelings and add more fulfillment to your life. It increases your spiritual well-being. And that kind of good karma will return ten-fold and continue for as long as you allow it into your life. Is Your Job Killing Your Love Life? What Is My Lucky Car Color? My mistake I actually I have Jupiter aquarius in 5th house! Id like my post before to be deleted >x< pls!